Cape Town – If you’re not one of the blessed few who get to watch the Rugby World Cup live in England this year, don’t feel blue. Most of SA’s Green and Gold superfans will be watching the games from this side of the world anyway, which means there’ll be plenty of rugby ‘gees’ going around. The 2015 Rugby World Cup kicks off on 18 September and the final will be played on Saturday, 31 October. We’ve sourced the best places for South Africans to watch the RWC from home. Catch the Springboks in the ultimate boktown fanpark in Joburg. 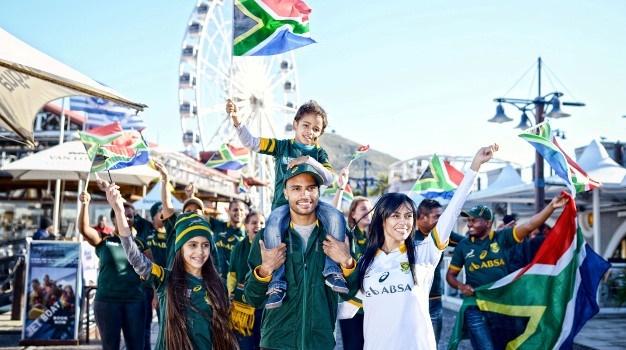 With a capacity to hold over 600 people, Gold Reef City’s Theme Park Town Square will play host to Absa Boktown throughout the Rugby World Cup. The Games will be screened on massive screens and there’ll be plenty activities for the whole family for the entire day. Tickets into the square cost R30 per person and include a complimentary SAB beer or soft drink and R5 donation to 'Let's Play'. The V&A Waterfront Amphitheatre will play host to one of the Cape's Boktowns. All World Cup matches will be screened on a brand new Amphitheatre screen. The opening ceremony and the first game on Friday 18 September will be the first to show. Entrance to this Boktown is FREE, but entrance will be limited to the first 500 fans per match. If you're not in Joburg or Cape Town, don't fear. Gold Reef City and the V&A Waterfront aren't the only places where South Africans can get into the World Cup 'gees'. Supporters at the Boktowns can look forward to meeting SA Rugby Legends, Bokkie the official Springbok mascot, grab great food and beverages, feel the gees, enjoy live entertainment as well as take part in sponsor promotions and great giveaways. There are three ‘Toads’ in the Cape; the Toad In The Village in Noordhoek, the Toad On The Road in Lakeside and the Toad & Josephine in Newlands. The owner, ex-Springbok Bob Skinstad says, “If you’re not in the stands, there’s no better place to watch the game” and we won’t argue with Bob. Who would want to watch the game in the miserable English rain when you can watch it on a sunny beachfront in Summerstrand? Unsurprisingly, Barney’s Tavern is going all out for the RWC. Go early to secure a table with a good view of the big screens, and pocket on their specials. A Bok Fan Package, for example, will cost you R240 and includes a 2L Jug of beer, four Springbokkie shots plus their famous snack Rugby Basket. Enjoy a cinematic screening with comfortable seating, a full PA system, two beverage vouchers and secure underground parking. Your booking includes a set menu for adults and kids, so bring the whole family along to enjoy the occasion. The SAB World of Beer is a popular tourist attraction and conferencing venue. Situated in the heart of the Newton Cultural Precinct in Johannesburg, the World of Beer is the home of beer culture in South Africa. READ: SAB World of Beer now open for Seven days a week... Cheers! Foresters Arms has been going for more than 150 years and they've perfected the art of serving superfans. These guys are equipped with the best TV's, the best food, the best drink and the perfect party environment - all contributing to the perfect 'gees' for watching the game with your mates.